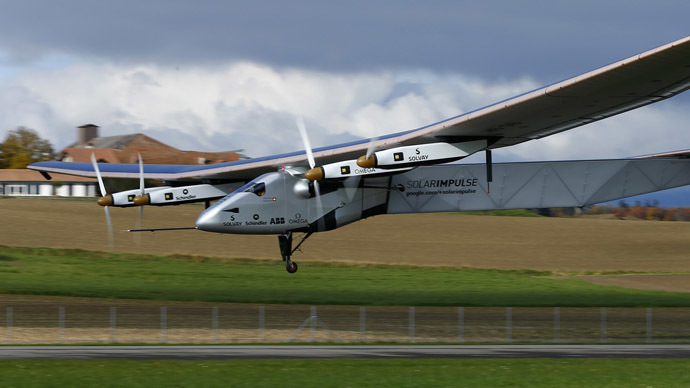 The second generation of the Swiss-engineered solar-powered airplane, Solar Impulse 2, has taken off from Abu Dhabi heading east to Oman – its first checkpoint on a daring five-month journey around the globe. The aircraft, piloted by Solar Impulse founder Andre Borschberg, successfully lifted off from the United Arab Emirates’ capital on Monday morning. The record-breaking 35,000-kilometer journey has been split into 12 stretches, with a total flight time of some 500 hours. The single-cabin solar plane will be piloted by Borschberg and Solar Impulse co-founder Bertrand Piccard in turns. The aircraft has a 72-meter (236-foot) wingspan – larger than a Boeing 747 – and is covered in 17,248 solar cells that power four electric motors. The plane weighs 2,300 kilos, about as much as an SUV. Flying at around 50 to 100 km per hour, the pilots plan to make a total of 15 landings for every five days of continuous flight. The Swiss pilots say they want to raise awareness about switching from “old polluting technologies” to “clean and efficient” ones. A crew of 65 air traffic controllers and weathermen will support the flight from a control room in Monaco. The plane is set to reach its first destination, Muscat, Oman, after covering over 400 km in 10 hours of flight. The plane will then head to India, China and Myanmar before traversing the Pacific and stopping in Hawaii. Across the US, the route includes Phoenix, Arizona, and New York’s biggest airport, John F. Kennedy International. The leg across the Atlantic will depend on the weather and could include a stop in southern Europe or Morocco before ending in Abu Dhabi. The journey’s coming legs, over the Pacific and Atlantic oceans, will consist of five-six days of flying solo, AP reported. The plane is scheduled to return to the UAE capital in late July or in August. The trip is being sponsored by the Abu Dhabi government, Masdar, Omega, Google, and Moet Hennessey among others.